This is a companion post to my earlier blog post A mountain of deceit: introducing Nepal’s Ministry of Tourism. In that post I outlined a number of statements the government of Nepal made in relation to mountaineering on Everest which turned out to be untrue. This post expands on one of the statements I described. 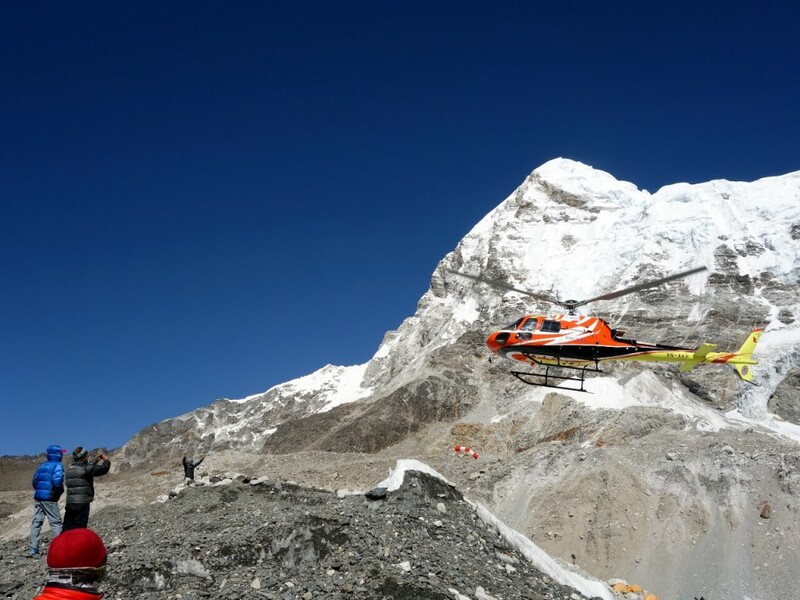 On 24 April a delegation of government officials flew into Everest Base Camp by helicopter to meet with Sherpas who had issued a number of demands following a fatal avalanche on 18 April. Afterwards the government issued a press release about the meeting that was misleading in a number of ways, and contradicted the outcome concluded by those of us who attended. Here is my account of the events I witnessed that day. Two days after an avalanche in the Khumbu Icefall killed 16 Sherpas, the government announced compensation of 40,000 Nepalese rupees (around $400 USD) for each of the families of the victims. 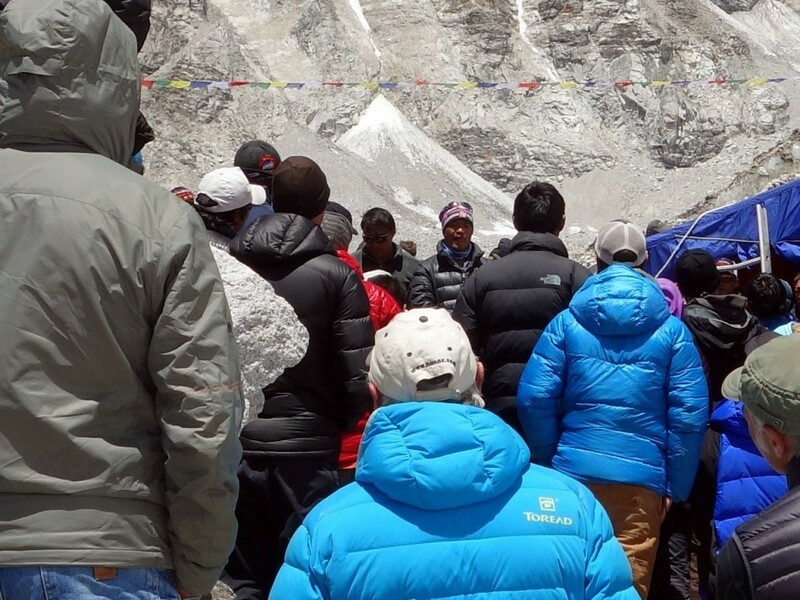 With permit fees of $10,000 per climber going into government coffers, the amount offered was seen as derisory by the Sherpa community, and galvanised a number of militant Sherpas into issuing a petition to the government containing several demands. These included additional compensation for the families of victims of the avalanche, setting up a trust fund for victims of future accidents, and better insurance for Sherpas. They also included a right to abandon their expeditions with full pay, a demand that could only be fulfilled with the agreement of western operators and their clients. While backing many of the demands, most westerners and some Sherpas wished to remain on the mountain and continue with their expeditions. The aim of the summit meeting was to reach an agreement that would satisfy most of the Sherpa demands while enabling expeditions to continue. After the meeting the Ministry of Tourism issued a press release implying they had talked with both operators and Sherpas and gained the agreement of all parties to continue with their expeditions, and that the mountain was therefore still open. Along with many other westerners I was a witness at that meeting, and I left it under no illusions that the season was now over. The press release issued by the Ministry of Tourism was disingenuous, misleading, and largely fictional. 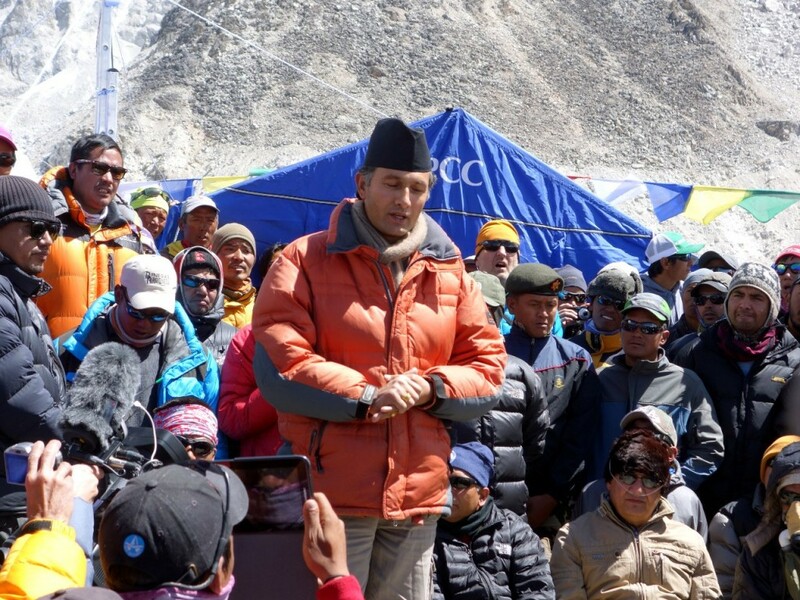 “Today, one high level delegation headed by Hon’ble minister for Culture, Tourism and Civil Aviation Bhim Prasad Acharya had visited the Mount Everest Base Camp and seriously discussed with mountain guide, supporting climbers and other concerned people. The delegation comprised with representatives of different tourism related organizations. During the discussion, the minister had urged to continue the expedition activities to all team leaders and members and requested to all concerned agencies to fix ladder & rope. At the time the supporting climbers also agreed to support expedition activities. However, if some expedition team wants to quit the expedition for this season and request to ministry to extend their permit, the ministry would make necessary process to extend the time of their permit for next five years for the expedition team of 2014 spring. It was about 9am when a number of helicopters arrived with various officials from the government and tourist industry in Nepal, and I hurried over to the tents of the Sagarmatha Pollution Control Committee (SPCC), where the meeting was due to take place. This had been the location for a puja (blessing ceremony) for the dead earlier in the week which had been hijacked by militants and turned into a political rally. Half a dozen chairs had been set out in front of one of the tents where the ground sloped away to a trough in the moraine of the glacier. In front of the chairs were several large boulders that people were standing on to watch, and behind these a sizeable mound of moraine formed a kind of grandstand providing a view of the proceedings for around a hundred people. I would estimate there were two or three hundred people in total watching the meeting, and there seemed to be an equal spread of Sherpas and westerners. I managed to find a space on one of the rocks where some of my team mates were gathered. We did not expect the meeting to last for long. 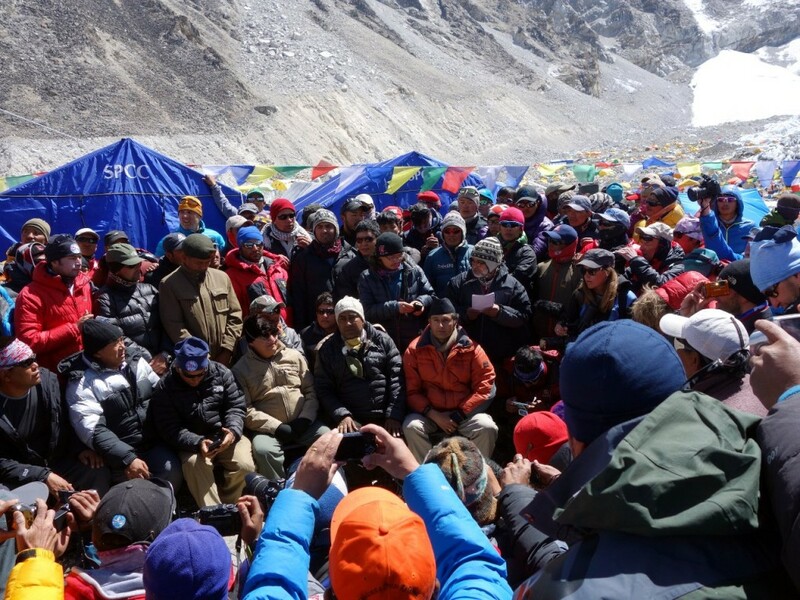 The delegation were flying in from Kathmandu at an altitude of 1400m, to Base Camp at 5270m. Most would not be acclimatised and needed to breathe supplementary oxygen from the moment they stepped out of the helicopter. Even with this it would not be safe for them to remain at that altitude for long. They would therefore need to conduct their business quickly and efficiently. The delegation reached the SPCC tents at 9.15 and immediately disappeared inside one of them, leaving the chairs which had been set out for our benefit empty. Several people had been milling around outside this tent and entered inside it with the delegation, including some of the known militants. I don’t remember seeing any westerners follow them in. For the first half hour the rest of us saw nothing of what went on, but watched in disbelief as trays of pancake, omelette, Tibetan bread, tea and soup were taken in. With not a moment to lose and the livelihoods of hundreds of Sherpas and expedition operators, as well as the hopes and dreams of an equal number of western climbers who had invested tens of thousands of dollars to be here, dependent on the outcome of this meeting, were the government officials taking breakfast? It seemed very disrespectful to those of us who had paid for all these people to be here. At around 9.45 the delegation emerged from the tent and everyone crowded around to take photographs as the most important members of the delegation took chairs and others who emerged from the tent, including some of the militants, sat on the ground behind them. An earnest looking man in a blue jacket then stood up to make a speech. 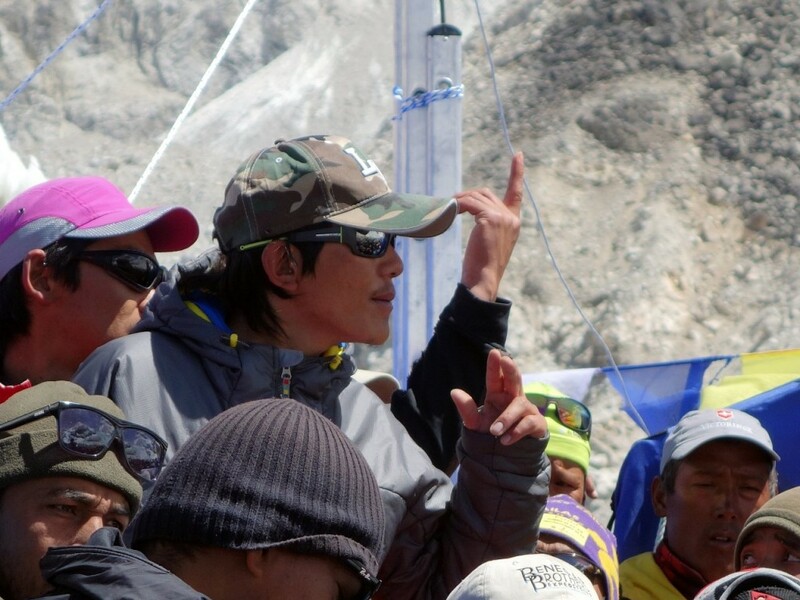 He was not introduced to the crowd, though I believe he may have been a representative of the Nepal National Mountain Guides Association (NNMGA), the body who regulate official UIAGM/IFMGA mountain guide qualifications in Nepal. He looked honest and projected his voice so that everyone could hear clearly, but he spoke entirely in Nepali. After 10 minutes he finished speaking, and half the audience clapped politely. The other half assumed someone would translate the speech into English, but it didn’t happen. Instead a second man in an orange down jacket and Nepali topi hat stood up and launched into another speech. Where the first man spoke solemnly, this second man spoke more passionately. Although he was not introduced to us I was later told by our climbing sirdar that he was Ramesh Dhamala, president of the Trekking Agencies’ Association of Nepal (TAAN), the trade body representing trekking operators in Nepal. Although he spoke in Nepali it was evident to all of us his words didn’t appeal to the militants. Several of them stood up from their positions behind the delegation and started moving around, gesticulating furiously and inciting other people in the crowd. Most prominent among these agitators was Pasang Tenzing Sherpa, sirdar with the British mountaineering company Jagged Globe. Was the speaker telling them they had to go back to work, that if they didn’t it would do great damage to Nepal’s tourism industry? Was he reminding them the trekking industry extends throughout Nepal, and by going on strike they would harm other people in poorer parts of the country? Whatever he was saying it was clear they didn’t like it, but we never found out, because his speech also wasn’t translated, and as far as I’m aware there are no transcripts available. A third man stood up and delivered a less impassioned speech. Again he was not introduced, but I believe he was Ang Tshering Sherpa, president of the Nepal Mountaineering Association (NMA), the organisation responsible for Nepal’s trekking peaks, and owner of Asian Trekking, one of the few teams on the mountain whose Sherpas had not signed the petition. Again he spoke in Nepali and received polite applause. Until now it had been hard to gauge the mood of the meeting or the direction it was heading, but apart from a few excited agitators during the second speech, there was nothing to indicate pressure was being exerted on the militants to return to work, or that concessions had been made to meet the Sherpa demands. 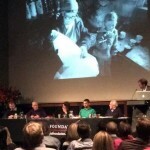 It was disappointing that with so many western climbers present who stood to lose a great deal if the season were abandoned, and who had paid tens of thousands of dollars into the pockets of many of the people gathered there and collectively put millions into the Nepalese economy, nobody considered it important enough to translate the speeches into English. The meeting now took a turn for the worse when Pasang Bhote, one of the leaders of the militants, stood up, turned his back on the crowd and instead addressed the delegation. I have been unable to discover which operator Pasang Bhote was working for this year, but believe it may have been the SPCC itself, the public body responsible for employing the Icefall Doctors who fix and maintain the route through the Khumbu Icefall. I may be wrong about this, and if anyone knows otherwise then please correct me. It was Pasang Bhote who had been most prominent at the puja earlier in the week which was turned into a political rally by the militants, and I believe he may be some form of mountain workers’ union leader. Today he spoke passionately at the government officials, occasionally receiving whoops of delight from some of the Sherpas gathered in the crowd. Again, I had no idea what was being said, but I didn’t like it. The atmosphere in the crowd did not seem aggressive, but all the westerners were keeping silent, and I had the feeling that if anyone interrupted then things could change very quickly. Just like the puja it was beginning to feel to me like the meeting had been hijacked by the militants and turned into a rally. At 10.30 it was clear which way the tide was heading. I no longer had the will to stand on a rock and listen to myself being shafted in a language I didn’t understand. 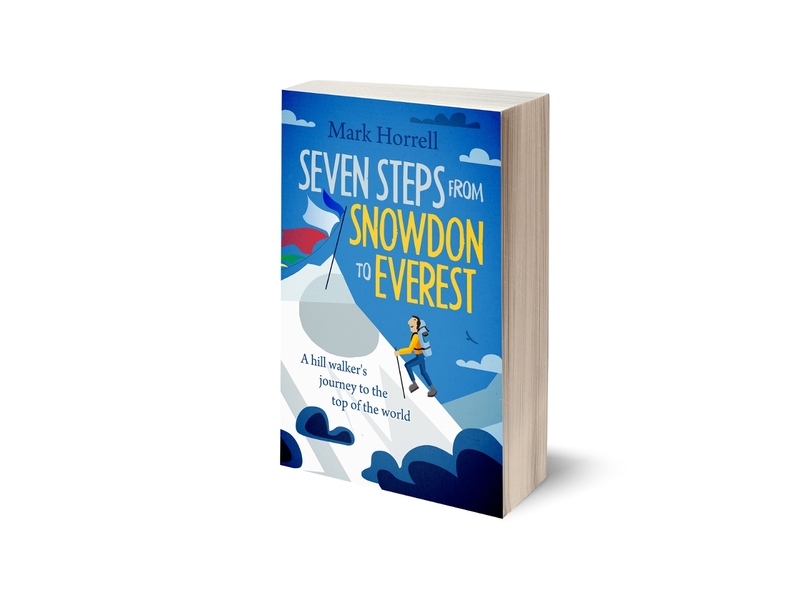 I stepped down and trudged wearily back to our campsite, utterly dejected and knowing my expedition was over before we had even begun to climb. The final act of the drama was described to me when other members of the team returned to camp. Shortly after 11 o’clock as I rested in my tent pondering the events which had led to this, I heard a distant rumble followed by a loud cheer much closer to where I lay. Everyone had left the SPCC tents and followed the delegation to the helipad near to our camp. Just as some of them were boarding their helicopter, another chunk of ice broke off the West Shoulder in exactly the same location as the one that had triggered the fatal avalanche. It was not as big an avalanche this time, but still it billowed across the same bit of climbing route through the Khumbu Icefall. The sun was up and warming the ice. It was much too late for anyone to be climbing through the Icefall had the route been open, but even so the timing of this event felt like a clear sign from on high. There was a time not so very long ago when Sherpas were superstitious folk who believed the mountains to be the abode of mountain gods. Perhaps some still are. Every expedition begins with a puja to appease the gods and ask for safe passage. But the cheer I heard as I lay in my tent was not the awed silence of superstitious people who had received a warning from the gods. This was the cheer of folk who were young and cynical, who don’t believe in mountain gods any more than we do. But we all knew what the avalanche meant this time. The militants had won the battle and we should all go home. It was all over. I didn’t see any discussions with mountain guides and “other concerned people”. It was all in Nepali and we were excluded. I certainly didn’t see any supporting climbers (ie. Sherpas) agreeing to support expedition activities. On the contrary they cheered to see the season was over. The minister may have requested concerned agencies to fix ladder and rope, but the reality was the Icefall Doctors weren’t fixing anything, and until they did none of us could climb. As for making all the required arrangements for the completion of expeditions, what was required was for the government to agree to the more reasonable of the Sherpa demands: more compensation for families, a trust fund and better insurance. 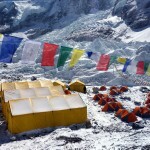 The army needed to be sent to Base Camp to restore order and provide protection for any Sherpas who wished to continue working, including the Icefall Doctors. 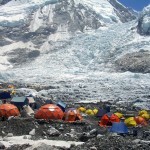 Police were needed to remove from Base Camp those who had threatened violence against other Sherpas and their families. Expedition leaders had met with government officials in Kathmandu the day before and explained these requirements to them. The officials promised these things would happen. Without them the Ministry could request all it liked for expeditions to continue, but they would not be able to. None of this was resolved at the meeting. The government’s press release was a work of fiction. Most tragic of all is that 16 brave men died in an avalanche, and their families will need to rely on the generosity of westerners for support. And while their deaths had the potential to do good, by being the catalyst that leads to better and safer working conditions for their community, it has so far done nothing of the sort. It has led to political activism that is divisive, that will very likely keep people away from Nepal and make it harder for the community to find well paid work. The government could have prevented this, but they failed, and then they lied about it. Great post. I’m still a little irritated by the whole mess. Wish I could scrap my plans to climb there but I want to climb these big hills. Sorry it didn’t work out for us. Do you plan to go again soon? I’m going in May 2015. I would love to go back and climb through the Khumbu Icefall some day, but I wouldn’t recommend dropping another $50,000 or more and going back next year, unless money is no object to you. None of the underlying issues that led to the problems this year have been addressed. – The government has not agreed to any of the Sherpa demands: no extra compensation for families, no trust fund, no increase in the minimum insurance, etc. – Nothing has been done to tackle the militant element within the Sherpa community, either by the government or operators. – It’s unlikely there will be police or army at base camp next year either, to provide protection against threats, and in view of what happened this year it would be difficult to believe any promise that there will be. – Permit fees are set to increase. You can assume the promise made in the press release (see above) to extend permits for 5 years will not be honoured. Despite pressure from operators the government have not confirmed this in writing or how it will work. You should therefore expect to shell out another $11,000 for your permit fee next year. – The issue of liaison officers going AWOL (ie. taking their money then not showing up at Base Camp to carry out their duties) has not been addressed. Expect this practice to continue. 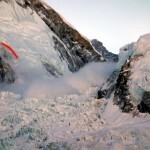 – Although many people agree the route through the Icefall should be moved to a more central line away from the West Shoulder, it’s easier for the Icefall Doctors to follow the same ropes from previous years. Unless operators (who have more experienced climbing Sherpas working for them) are allowed to assist in this part of the rope fixing then it’s likely the route will remain the same. – Although the circumstances of the avalanche this year were desperately unlucky, other accidents are still likely to happen, if not on this scale. With none of the underlying problems addressed there is a high risk the political activity we saw this year will bubble to the surface again next year should another incident occur. I don’t know about anyone else, but my expedition insurance policy with the BMC (British Mountaineering Council) didn’t cover me for a penny of what I lost this year. I’m grateful for those like you who are willing to return next year in spite of what happened. You’re braver or richer than I am (and probably both 😉 ). I’m unwilling to risk that sort of money next year, but I will be watching events closely! N.B. Error–for Tibet read Nepal. I suspect what you’re feeling comes from reading media reports written by people who are there to report on controversy without having experienced expedition life. There’s plenty of warmth in mountaineering today, just like I’m sure there was in the past. Hopefully you can get a sense of this from my trip report (https://www.markhorrell.com/blog/2014/the-worlds-most-expensive-everest-base-camp-trek) and what a close knit team we were, both clients and Sherpas. Most books that are published these days seem to be about extreme ascents or tragedy, which provides an unbalanced view of what it’s really like. We returned to Kathmandu having forged many new friendships and bewildered by what had happened. We all return to Nepal again and again and have great affection for the country. There are still plenty of pioneering first ascents, but the world is getting smaller, and Bonington and the likes would have to look for new adventures in different ways. Regarding the “strange facts” you refer to, I talked to a lot people, both at base camp and back in Kathmandu, and have kept in touch since returning (as well of course as witnessing a lot while I was there). Sorry for the delayed response. I returned from Nepal to a huge workload and am just catching up with the last bit of email. At any rate, I am neither rich nor brave. Perhaps stupid might be a better characterization of me and my desire to continue climbing. I really feel the pain of my financial loss – to the extent that I am forgoing my weekly pub outings just to save for next year. Additionally, I plan to skip eating out save for the times when my wife and son have had it with my cooking. The loss really hurts but I cannot give up; I want to succeed of fail by my own hand and not by the hands of some thugs who threatened my peaceful climbing friends. I occasionally feel bitter about the entire mess but I need to keep focused on my objective. Anger or resentment is just energy spent in the wrong direction. I suspect you are right about the points you made in reply to my post. If what you say happens, I will really be angry and probably never return to Nepal. There are countless peaks I wish to enjoy and Nepal has no monopoly on them. I would love climb in the Karakorum but that may require a bit of negotiation with my family. For now, I, like Kate, cheer on Alan Arnette and others who can climb for us all. Thanks for taking the time to reply. I hope we can enjoy a cup/pint together one of these days. Let’s keep our fingers crossed everything goes smoothly next year. I’m not optimistic the militant element will go away unless the government acts, but we can hope. Either way, good luck in pursuit of the dream. It’s a dream I understand. Changing circumstances: I ought to correct one of the statements I made in my first comment above. I originally said I wasn’t covered for a penny of my aborted expedition through my BMC insurance policy. At the time of writing BMC’s underwriters had refused my claim in its entirety. Upon appeal they reconsidered, and I have since been award £5,000 GBP, which is the maximum the policy provides for curtailment of a trip. It was still an expensive Everest Base Camp trek, but this was at least some consolation. Congratulations Mark! I was happy to read that the insurance covered some of the expensive trek. Do you plan to purchase this type of insurance again or do you feel it was a waste of money? At first, I felt foolish for not purchasing trip insurance like the type you described but your experience – along with countless others – made me feel somewhat justified in skipping that expense. Thanks for the update. This is my first comment on your website and I would like to thank you for very insightful posts. But I do not seem to agree with your ramblings about the Everest disaster this year. Yes, you and some other folks lost their money and time, but the tragedy gave an opportunity for some Sherpas(the militants, although I do not agree with your choice of word) to organize and highlight their problems. In the short run, some people might lose some money but in the long-run Sherpas might get a better return on their magnitude of risk(which is currently too low). So, lets wait for few more years before coming to conclusion. I’m sorry to hear you don’t agree. You are entitled to, but are you prepared to put your money where your mouth is and donate $50,000 USD of your own to support the militant cause? Unforeseen events. Just because the cause is not favorable to you does not make it militant. Choice is between someone’s current 50k vs someone’s future income and insurance. Try putting yourself in Sherpas’ shoes to understand why they are ready to bite the same hand that feeds them. This seems a fair description of people who are prepared to go on strike for their cause and threaten to break the legs of anyone else who doesn’t go on strike. We are talking about only a small minority of the Sherpa community who are militant, and it’s important to make a distinction between the Sherpa cause and the militant cause. I identify strongly with the Sherpa cause (see my latest post on 4 ways to improve the south side of Everest), but you are right I find it very difficult to put myself in the shoes of people who are prepared to threaten violence against anyone who disagrees with them.